The Microchip SAME70Q20 devices are members of a flash microcontrollers family based on the high-performance 32-bit ARM Cortex-M7 processor with Floating Point Unit (FPU). These devices operate at up to 300MHz and feature up to 1024 Kbytes of Flash, up to 384 Kbytes of multi-port SRAM and configurable Instruction and Data Tightly Couple Memories to leverage the advanced DSP capabilities of the core. SAME70Q20 features multiple networking/connectivity peripherals, including CAN-FD interface and one 1O/100Mbps Ethernet MAC with specific hardware support for Audio Video Bridging (AVB). Additional communication interfaces include a HS USB Host and Device, a HS SDCard/SDIO/MMC interface, USARTs, SPIs and multiple TWIs. Analog features include dual 2Msps 12-bit ADCs with analog front end offering offset and gain error correction, and 2Msps 12-bit DAC. The SAME70Q20 is available in 144-pin QFP and BGA package options. The ATSAME70MOTOR is an MCU card for Motor control starter kit - ATSAMxxxBDLCxxx-STK. 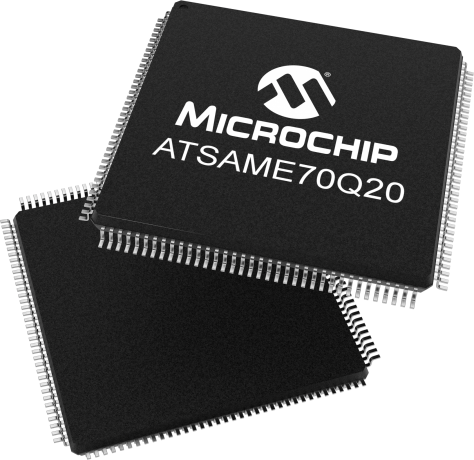 The hardware has the SMART ARM based MCU, ATSAME70Q21A-AN, with integrated on-board debug support. The MCU card can be directly used with the currently available ATSAMD21BLDC24V-STK, a low voltage BLDC, PMSM motor control starter kit.